Ever wanted to sail through space on an mechanically unsound rust bucket while drinking Vodka from a sippy cup? Now you can! 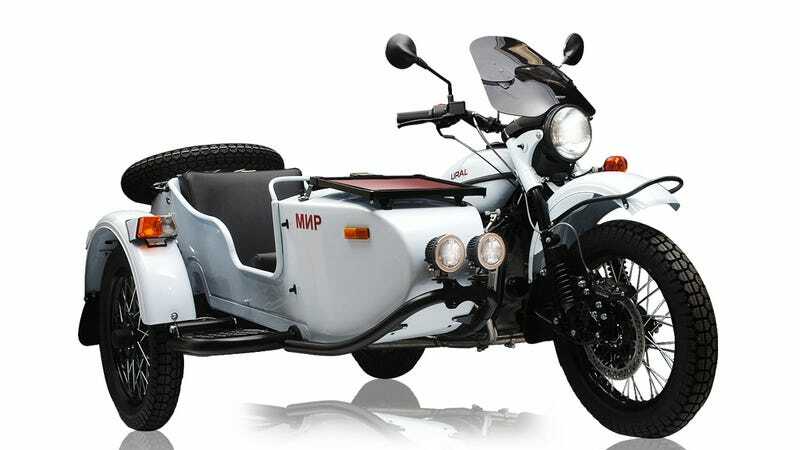 This MIR replica Ural sidecar pays homage to the pioneering Soviet space station. Based on the revised-for-2014 two-wheel drive Gear Up model, this limited edition gains a solar panel mounted to its sidecar body, powerful LED spotlights and a heat-reflecting space blanket tonneau cover for the passenger compartment. MIR comes in a brilliant orbital white with fine metal flake and finished with blue pearl clear. The result is a glowing white Ural with hues of blue that shift with the light - the perfect paint job for your intergalactic mission. The solar panel actually sounds like a genuinely useful addition, providing a trickle charge to the bike's battery or providing charge for your gadgets. For a bike that's capable of travelling a long ways off a paved road, through any type of terrain, that's a valuable addition. "Мир" is Russian for "peace" or "world" and was assembled modularly in space between 1986 and 1996, MIR remained the largest satellite in orbit until 2001 and hosted visiting astronauts from around the world who conducted a huge variety of zero-gravity experiments. It was probably the Soviet Union's crowning technological achievement, exceeding all Western efforts in its day. As a little flourish, the MIR sidecar comes equipped with a very large wrench imprinted with the words, "When All Else Fails," and a QR code linking budding mechanics to this instructional video. That's a clever play on Ural's old reputation for poor quality and bad reliability; two qualifiers that no longer apply to the company's products. Its new owners have spent the past decade bringing the motorcycles in-line with western quality standards and modernizing performance and handling. You can now describe the riding experience as "safe," something I did when I rode the heavily-updated 2014 model late last year. Just 20 of the $16,999 MIR Urals are available now.